an Italian Interior Ministry’s official statement reported on September 15th, 2017. The statement also points out “the need to complete the training activities of the Libyan Coast Guard with the aim, at the end of the courses, of giving back the ships of the naval units still guarded by Italy” and states that “Italy will send emergency aids to the local area’s [South] communities through the institutional channels of the Libyan authorities”. The last shipments were sent by Italy to the coastal towns of Sabratha and Zwara back in August 2017. Details of the mission still lacks: inside or outside Libya? It’s not clear, as for the statement, where the mission would be set up, whether inside or outside Libya: while the statement simply reads that “[the Libyan authorities […] called for a major engagement from Niger, Chad and Mali […]” a Sole 24 Ore‘s article anticipating parts of it just reads of “a mission at Libya’s Southern border, thus in correspondence of Niger and Chad”. The article also stated – by quoting anonymous “sources from the Ministry” – that “the mission’s details have yet to be defined”, that could maybe explain the ambigous formula in the statement. Set up inside Libya, it would be the third Italian mission in the Country after the first one in Misrata started in October 2016 and the second one in Libya’s national waters off Tripoli, launched in August 2017. About a military collaboration between Rome and Tripoli over the South: Italy officially rejected reports of a mission last May. “Italian troops will collaborate with the Libyan police forces over controlling the Southern border”, Sole 24 Ore also stated with details not included in the official statement. 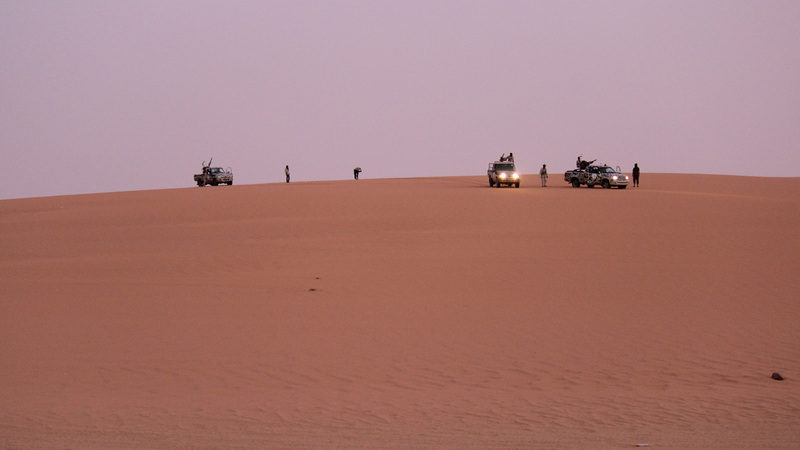 While Italy’s secret services likely collaborated with some Libyan military personnel in the South as two Italian workers were briefly kidnapped near Ghat and then succesfully released in November 2016, Italy’s CoS office officially rejected press reports of a mission just outside the Libyan border – exactly in Niger – the following May: the mission, back then labelled as Deserto Rosso (Red Desert), appeared to be very similar to the one now officially agreed. Italy’s Interior Minister Marco Minniti, however, has strightened contacts with the neighbouring Countries of Libya, meeting their representatives at least twice in Rome during 2017: in the latest of the two meetings Mali also attended for the first time. What about LNA’s presence in Fezzan? Back in August, Marshal Khalifa Hafter mentioned both Italy and Europe when interviewed by the Italian press soon after he had verbelly threatened the Italian warships in the national waters off Tripoli. In that occasion he spoke in a more friendly way, calling on Rome and Bruxelles to support him over the control of Libya’s Southern border. Now Italy seems to let the calling fall, as the Libyan – Italian committee aggreeing the mission is a creation of the February 2017 Memorandum of Understanding (MoU) between Rome and Tripoli’s UN backed Government of National Agreement (GNA) lead by Fayez Serraj. The MoU has been recently declared valid by Libya’s highest judiciary court and Tripoli’s deputy Interior Minister Abdel Salam Ashour lead the Libyan delegation to Rome, according the Italian Ministry’s statement. Yet, Hafter’s Libyan National Army (LNA) succesfully set up its control in Libya’s Fezzan after May 18th, 2017, Brak al Shati massacre, forcing Misrata’s Third Force and other groups to withdraw from there; Libya Herald has recently reported about LNA reorganising its ranks in the area. On September 5th, LNA shared a picture showing Khalifa Hafter and Italy’s Interior Minister Minniti shaking their hands after meeting in Benghazi: though it appeared like an official picture, Italian Ministry of Interior never officially commented the picture and its publication, apparently highlighting it was not ready to meet Hafter publicly as Italy’s Ambassador Giuseppe Perrone had previously done, at the countrary, back in April. In a recent visit to Russia, LNA’s spokesman Ahmed Mismari confirmed LNA’s commitment to the Southern border “on the condition that the weapons’ embargo is lifted”, Russian news agency Interfax reported last September 13th. In that occasion, Mismari also slammed as “a great conspiracy” “unacceptable to us” the engagement of Italy and other European Countries on Libya’s Southern border: “we are trying to solve this problem through negotiations with Italy on revisiting the 2007 [correctly: 2008] treaty, which, by the way, banned the establishment of camps in the south of the country” he also reportedly said, meaning that relations between Italy and Eastern Libya are not completely broken despite the official de facto distance of the very last times. Italy gains EU’s support over migration, ties with local governments and Libya’s borders. By carrying out actions in Libya’s South, Italy would pursue the goal of curbing the illegal migratory flows coming from the Countries South of Libya and crossing Libya to reach out Italy and Europe through the Mediterranean Sea. The same goal Italy pursues by strenghtening its own ties with Libya’s North Western coastal towns such as Sabratha or Zwara and by training the Western Libya’s Coast Guard in the framework of the EUNAVFORMED EU naval mission. While Italy’s relations with Sabratha have been accused of unclarity by both the Italian and the international press, Europe has shown signs of fully supporting Italy’s way and its rejections of the reported unclear channels – traffickers themselves – over crushing the illegal traffics of human beings: European Commissioner Dimitris Avramopoulos has recently said – Italian news agency ANSA reported – that “everything has been made in clarity and transparence, with no hidden channels or negotiations behind the scenes”. Speaking to a parliamentary committee in a closed-door meeting early in September, Italy’s Prime Minister Paolo Gentiloni said Italy has no agreement with Sabratha’s traffickers, as it has links with Libya’s “village leaders”, the head of the committee reported with an apparently confused description of what such “village leaders” should be. As for the EU funds Italian Interior Ministry’s statement mentions, EU High Representative Federica Mogherini September 12th’s statement had borne them out as she said that “most recently, we have launched a €46 million program to help manage the southern border of Libya, run together with the Italian Ministry of Interior”. Great web site. A lot of useful information here. I’m sending it to a few friends ans also sharing in delicious. And of course, thanks to your sweat! Thank you for reading and commenting, Margaret.